Note: This was created before even the 1.0-series Hero Factory sets were released. Modern-day "Hero Factory parts" did not even exist. Another enemy our Hero Factory warriors may encounter is Gerulan. Powerful in his own right, Gerulan is independent of mind and does not directly serve Von Nebula, though he has done some "contract" work for the evil overlord in exchange for credits and territorial passage privileges. Gerulan may be frighteningly tall in stature, but his structure is surprisingly light in weight, with little armor to cover his high-strength metal skeleton. Wise patience and explosive speed are his primary tools of battle. Below we see a sequence of Gerulan pouncing upon a small training 'bot. The hardened alloy spikes that adorn his triceps sweep forward as he strikes, and he brings them down from above with crushing precision, spearing and pinning his foe to the ground. A single Hero stands no chance in a fight against this malicious giant. Launched my Lego Hero Factory blog! I just launched my new LEGO Hero Factory blog with my very first HF MOC! Go check it out & bookmark it! LEGO Hero Factory MOC: Vaptix R-1S "Harrasser"
The Vaptix R-1S "Harrasser" is a light armed scout that is technically classified as a "medium weight" model due to the oversized laser that is the standard equipment on its articulated universal mount. The R-1S is designed to excel at navigating exceptionally rough terrain such as volcanic mountains or city ruins. Multiple units can be wirelessly networked together with "pack" behavior software, and multiple packs can in turn be interfaced to act as a "flock." The Harrasser generally operates on four legs, but its hind legs can reverse for two-legged operation, handy for transportation and storage. In practice, Harrassers have been mostly used as solo perimeter defense units around the hideouts of the Hero Factory's enemies. LEGO Hero Factory in effect! Hi all! "The JANG" here from Bionicle-Untold.com and Bionicle Untold: Behind The Scenes. I'll be sharing my LEGO Hero Factory creations (aka "MOCs") here once they start to arrive. 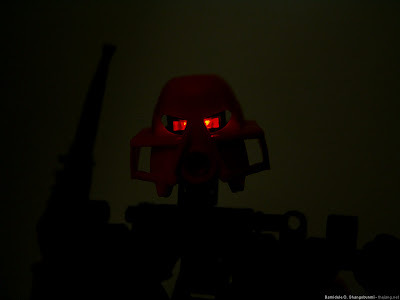 In the meantime, check out my two Bionicle sites and read my thoughts on the discontinuation of the Bionicle series and upcoming launch of Hero Factory. I may be a little late to the party on this one, but go easy on me. 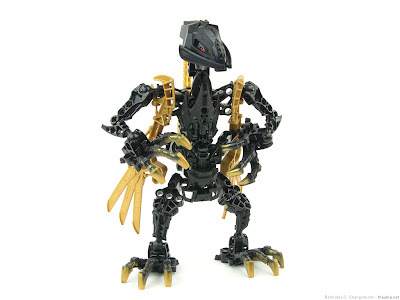 I only recently learned of the sudden cancellation of the Bionicle series. When I first saw the headline, I was devastated. As I began to actually read the full story, that devastation gave way to hope. 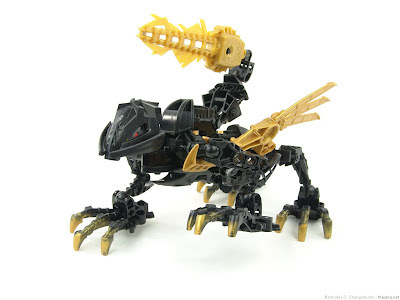 When I then looked up the new Bionicle replacement series, LEGO Hero Factory, I was completely & utterly delighted. It wasn't long before I had jumped in head-first and started my own first LEGO Hero Factory MOC. Bionicle had a good run -- a solid decade. In its heyday its popularity was off the charts, its fans completely loyal and dedicated. The stories were captivating, and the figures & parts just kept getting better with every release. Over the past few years, though, even some of the most devoted Bionicle followers have grown weary of recurring themes in the storylines, some truly bizarre plot spin-offs with the alternate realities, and (arguably) diminishing quality & uniqueness in the figures. The luster has largely worn off. The ending of the figure series came earlier than planned, and it's sad, but LEGO made the right decision here. 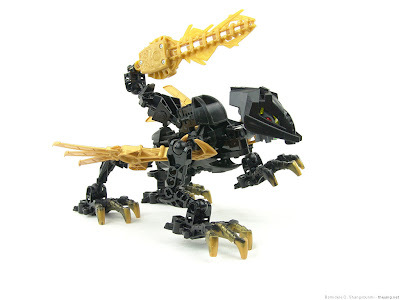 Fortunately, the official storyline will continue on the Bionicle site. We will still be able to follow along as Mata Nui fully re-ignites his powers, helps the citizens of Bara Magna re-assemble giant robot #2, and gets in it to go have an epic battle with the Makuta to liberate Aqua Magna and restore the Matoran Universe. What we won't have to bear with is seeing re-hashed releases all of the previous characters in toy stores as the story brings us back to them. We also won't be pacified with random newly-imagined Bara Magna rahi sets or additional forgotten tribe members (and their overpriced or not-so-exciting vehicles). 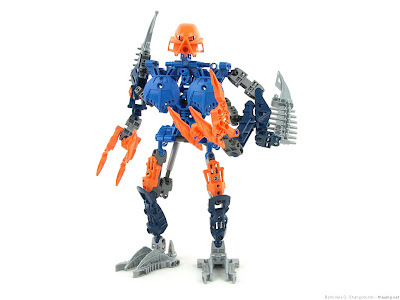 Instead, we will get Hero Factory figures, a series that continues to build upon the Technic foundation and welcomes the reuse of most of our Bionicle pieces. It will have a storyline, but it will more than likely be shallower and less rigid than what we saw with Bionicle; something a little closer to what they've done with System series. Like most folks who have commented to date, I think the names of the official Hero Factory "good guy" characters are lame and a disgrace. But I can get past that aspect. As a MOCer and big proponent of creativity in general, I like how the Hero Factory concept very strongly encourages fans right from the start to think up their own unique characters and have them interact with the story. 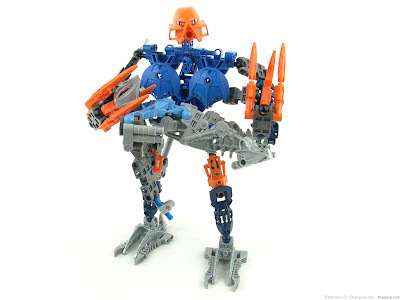 Bionicle never really did that. 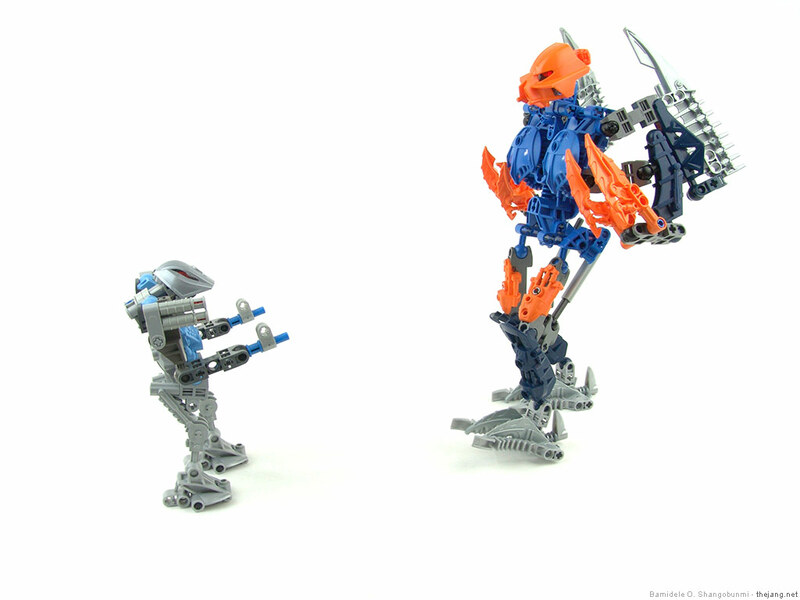 The Bionicle universe had very little building & creation involved in it. All of the official characters existed before we were introduced to them. 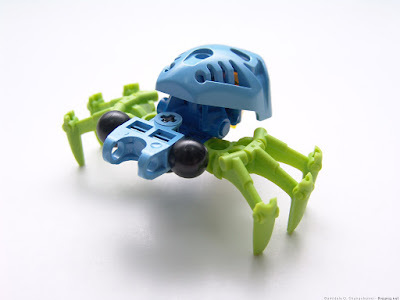 I'm hoping to see some Hero Factory kits come in bucket form, a la the Ultimate Creatures set, but with several suggested builds and encouragement to create more. I can see this going really far with some very serious worldwide contests. Online games where you can actually build your custom hero and then play as it would be awesome, too. Imagine a cross-platform game where you can build on a PC computer, upload it, then play it on an XBox 360! 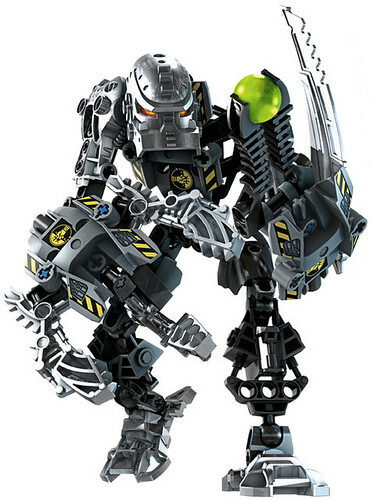 In closing, I have to send a big "thank you" to LEGO for creating the Bionicle universe. As the company moves on, Bionicle fans will continue to move forward with our creations, many of us drawing on pieces from the Hero Factory series, and many of us moving on too, but bringing our buckets of Bionicle pieces with us! 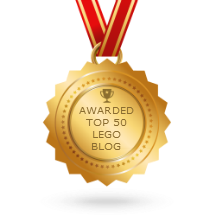 PS: Be sure to visit my new LEGO Hero Factory MOCs site! Rumors of my demise have been, well, wrong :) Ok honestly, I don't know if there have been any such rumors, but I have obviously been embarassingly absent for the past few months. You see, I got into LEGO Bionicle building to relieve stress from a demanding job. Late last September, though, I actually quit that job and have since been giving most of my attention to the websites I've been running for almost 10 years in another hobby. I'm happy to report that I'm all mentally recovered from work and things are going great with my other sites, so I'll again be able to do some occasional updates in the Bionicle world. Thus far, I've only published about half of my MOCs, even counting the Ardaberry Fikou above (when sitting on a leaf or green vine the legs are camoflaged and all you see is the body, which looks like, you guessed it, an Ardaberry). I have many things to share yet and Zeyek has more stories to tell! On top of all that, I still have 15 to 20 pounds of unused parts just waiting to be assembled! It's both surprising and humbling to see that the the popularity of my two Bionicle homes on the web has actually steadily increased, so to all of my visitors, a hearty thank you for your support! I'm looking forward to the next chapters!